Since July 2013, an artist studio and apartment are available at Pfingsweidstrasse, in the immediate vicinity of the Toni-Areal, the future campus of Zurich University of the Arts (ZHdK). 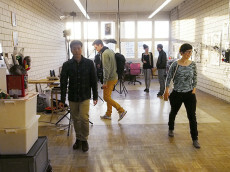 The studio and apartment are part of the City of Zurich Artist-in-Residence Programme for Young International Artists. The studio-based residency includes a mentoring programme designed to help scholarship holders make the transition to professional practice. The programme welcome applications from postgraduates from various disciplines across the arts (fine arts, media arts, photography, film/theatre, dance/performance). who are engaged in artistic experimentation and research. The results of each of the artist in residencies were shown in Connecting Spaces Hong Kong- Zurich.